If sushi is your thing, En at Mehrauli is where you should head to. The interiors of En remain true to the cuisine while steering clear of the cliches. It's not a five star establishment or a global chain, but En - with its distinctive cuisine-makes a happy dent in Delhi's Japanese restaurant scene. 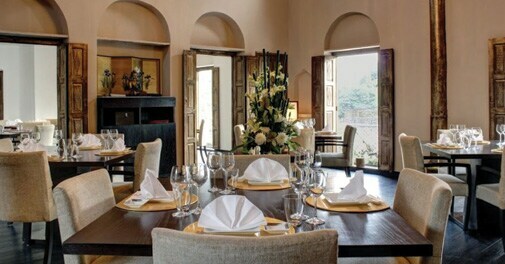 Located at Ambawatta complex in Mehrauli with expansive views of the Qutub Minar, the interiors remain true to the cuisine while steering clear of the clichÃ©s. The restaurant boasts of near-fantastic service, and the fact that it brims over with Japanese families on weekends and businessmen on weekdays is proof enough of its authenticity. The chef is from Japan, and that's what helps distinguish En's food from other restaurants of the kind trying to make their mark in the city. We began with the assorted tempura platter, and while I have never been a fan of this dish, the rendition was very good. The batter was light, and in the absence of excess oil, the vegetables and prawn remained crisp and flavourful. Similarly, the teppanyaki foie gras with scallop and braised radish - cooked in a manner that retains its true flavour-literally melted in the mouth. Each roll of the sushi nigiri take, an assortment of the day's best, was crafted to perfection and served with fiery wasabi that truly hit the spot. But if you are still hungry after your sushi craving has been met, I would recommend the fish of the day in a spicy miso sauce. Though a tad salty, it's fresh and light. While much of the menu at En has been crafted with the native Japanese in mind, the menu is easy to navigate through - even for vegetarians. The only disappointment was the assorted dessert platter, which could have done with a much-needed facelift. Nevertheless, round off your meal with a pot of green tea and you'll leave feeling happy and content. The prices at En are on a par with other Japanese restaurants, so be prepared to spend generously if sushi is your thing.